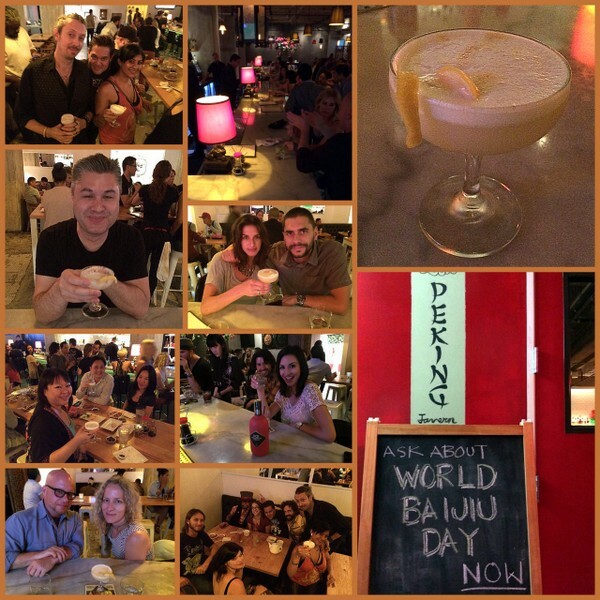 By Jim Boyce | Peking Tavern in Los Angeles was among the first venues to hop on board for the inaugural World Baijiu Day last year and ended up with one of the best events (see pics below). The Andrews—co-owners Andrew Chiu and Andrew Wong—are back this year with more fun. “You should definitely try the One-Inch Punch made with HKB,” they say. There will also be $7 baijiu cocktails “’til you feel like you can speak Chinese”, including regular menu items Wong Chiu Punch (baijiu, hibiscus and fresh lemon juice), Peking Coffee (baijiu, coffee and horchata liqueur) and Bloody Mei Lee, a baijiu-inspired spin on the Bloody Mary. You can also try the cool combo of Xifeng baijiu with celery juice chaser ($5 ). Peking Tavern is at 806 South Spring Street in downtown LA. Its website is here.